Decades ago, the idea of an autonomous bus seemed like the stuff of fiction. Most people never imagined us living in a time where vehicles could operate on their own, but it appears that the time could be upon us sooner than we thought. In recent years, major developments in technology have opened the door for self-driving automobiles. Innovators are creating opportunities for passengers to experience travel in an entirely new way, and there are a few in particular that are leading the surge. Because the use of public transportation has steadily declined, there are hopes that the creation and implementation of automated buses will re-invigorate the industry in major cities. There has been a call for a major overhaul with public transportation in a number of major cities throughout the United States. New York City is currently facing several major issues with bus transportation that echo the struggles of smaller cities across the nation; bus ridership has seen a steady decrease for nearly the last two decades, with a 16% decrease between 2002 and 2015. While there is a debate as to why ridership continues to decrease in major cities, a few of the speculated reasons are because of service cuts, traffic congestion, and an overall lack of interest amongst younger commuters. Industry professionals believe automated buses are the key to changing an outdated public transportation system. Creating a more fluid transportation system may encourage more people to start relying on buses rather than taking taxis, using rideshare apps, or driving. What is an Autonomous Bus? An autonomous bus is an electrically-powered, self-driving vehicle that transports twelve or more passengers. Autonomous buses are operated without a driver inside the vehicle, instead utilizing cameras, sensors and remote controls to properly steer their way through traffic. Although we already know about a few of the companies leading the pack for driverless cars, not much is known about the developments involving buses. Because buses typically have more advanced technological requirements and handle more passengers, a driverless motorcoach is a vehicle that is more difficult to engineer and operate. Experts are hoping that autonomous buses will reduce some of the road risks most drivers face on a daily basis. What Are The Road Risks Drivers Face? Vehicular accidents are one of the leading causes of fatality in the United States, and many industry professionals believe driverless automobiles can save a significant number of lives in the long term. Most drivers are placed in compromising situations due to lack of attention, fast driving, illegal maneuvering, and reckless driving habits, and autonomous vehicles may be able to reduce the number of humans on the road committing these errors. In 2016 alone, over 40,000 vehicle-related deaths deaths occurred on the roads, and more than 1,000 people per day are injured due to distracted driving. What Problems Could Autonomous Buses Solve? Autonomous buses could solve a number of problems that the transportation department currently faces. One of the primary benefits of autonomous vehicles are reduced expenses on drivers and operations. There’s also a strong likelihood that that autonomous buses would reduce the amount of truck and bus-related crashes occurring due to human error, which according to the DOT, caused $87 billion worth of damages in 2013. Industry professionals in Singapore speculate that the implementation of autonomous buses will encourage riders to use more ride-sharing platforms and public transportation, reducing road congestion. From an environmental standpoint, greenhouse gas emissions could see a slight reduction with fewer gas-powered vehicles on the road. By building and operating electrically-powered buses, transportation companies are able to reduce their carbon footprint. Autonomous bus manufacturers believe that self-driving buses will reduce the number of traffic risks, overall increasing the safety of passengers. Jay Akin, CEO of Mushroom Networks, provides connectivity services for autonomous bus manufacturers. Mushroom utilizes IP connections to connect autonomous buses with their remote operators, give passengers access to WiFi while riding, and connect POS systems to the buses. While Akin believes that autonomous buses may reduce the risk of accidents, bus operator Nemark Gipson believes that the use of technology could potentially increase the risk of accidents. Nemark Gipson is a professional bus driver for the Metropolitan Transit Authority of Harris County, also known as METRO. METRO transports civilians in the greater Houston Area, and operates bus, light rail, bus rapid transit, and paratransit services. How Would Autonomous Buses be Implemented? Autonomous buses may be built from scratch, or built by retrofitting existing city buses with new technology. In the public transportation sector, driverless buses will replace a majority of the gas-powered buses found in cities. Ideally, state governments will fund the production and development of dozens of electric buses in major cities. In regards to private transportation, smaller companies may have a harder time accessing autonomous buses. Autonomous buses will be harder to finance for smaller family-owned operations, but larger bus companies will likely able to afford fleets of autonomous buses. What’s the Impact on Human Bus Drivers and Riders? There are different sets of concerns for potential drivers and passengers of autonomous buses. Passengers will likely experience some noticeable changes as well, especially in regard to their riding experience. Passengers may notice a difference in the traveling experience without a driver Drivers are typically able to deal with spontaneous or split-second issues that require human decision making. Without human drivers, there is a risk that there will be less security on buses, a less intimate riding experience, and more unease among riders unfamiliar with the technology. China has been ahead of the curve with autonomous vehicles for some time now, having unveiled the world’s first autonomous bus for testing in 2015. The bus utilizes cameras, lasers, and a master controller to maneuver and operate in cities. The bus maintains a driver behind its wheel in case anything malfunctions, but for the most part, the operator is not involved with the vehicle’s operation. London is also on board with the movement, as British transportation company Oxbotica recently ran a test involving 100 volunteers on driverless buses. Utilizing five cameras and three laser units, this bus only seated four people and had a maximum speed of 10 miles per hour. Navya, a French technology company, also recently tested an automated bus called an ‘Arma’ in Las Vegas. The automated bus traveled a three-block route around the Fremont entertainment district, and marked the first time a self-driving bus operated on American soil. The bus was limited to operating at 16 miles per hour (with a max speed of 30mph), had sensors that detect obstacles, and an emergency button a passenger can use to stop the vehicle. 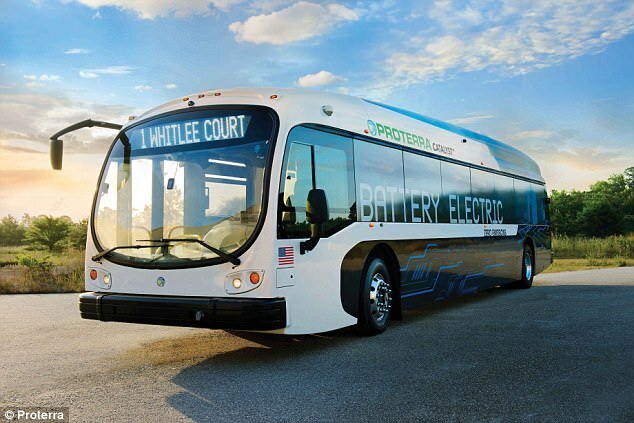 Proterra, an electric bus manufacturer, recently announced a plan to create self-driving electric buses. Their three-part plan was created with the goal of developing an autonomous public transportation system, which will, in turn, make mass transit safer and more efficient. What’s the Future for Autonomous Buses? A number of companies are hard at work developing the technology to make autonomous buses a reality. With the rate at which technology is progressing, it’s anticipated that we may see autonomous buses on the road within the next five years. When do you think autonomous buses will be on the roads? Do you believe that self-driving buses will have a significant impact on the public transportation industry? How might passengers and drivers be affected?